BERWIN LEIGHTON PAISNER LONDON, UNITED KINGDOM. Lawyers Solicitors Law Firm. Advocates – At –Law, Acting Solicitors, Notary Public, General Legal Practitioner, Conveyances, Commercial Law, Admiralty, Trust, Civil Litigation,Personal Injuries, Wills, Property Transaction. Good day sir, Your email was received and well understood but,please be advised! 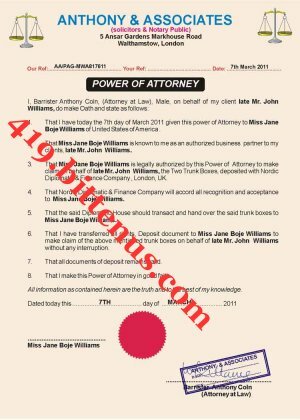 I have been assigned by this law firm to get across to you concerning the legal paperwork back up for inheritance bequest of Late Mr. John Boje Williams which we have your fiancee Ms. Jane Boje Williams as the beneficiary/Next of kin to this inheritance bequest as the only daughter to our late client. 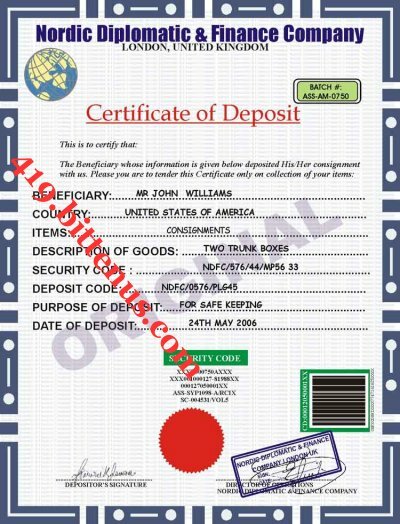 However,i choose to inform you with the power vetoed on me to send across to you the attached POA(Power of Attorney) and COD(Certificate of Deposit) documents as proof of the existence of the Trunk Box deposited with the Nordic Diplomatic & Finance Company Limited UK. Attached herein is the documents which you are to send across to the Security company as soon as possible to avoid further delay in this claim process while, i expect you to download and read carefully for your perusal and also for record proposes. We hope to hear back from you as soon as possible. BERWIN LEIGHTON PAISNER LAW FIRM, UK. The information contained in this communication is confidential and may be legally privileged. It is intended solely for the use of the individual or entity to whom it is addressed and others authorized to receive it. If you are not the intended recipient you are hereby notified that any disclosure, copying, distribution or taking any action in reliance on the contents of this information is strictly prohibited and may be unlawful. Berwin Leighton Paisner law firm,UK® or its related companies are neither liable for the proper/complete transmission of the information contained in this communication nor for any delay in its receipt.